Palma is the major city and port on the island of Mallorca. Palma offers a rich mix of history, culture and nightlife. Fascinating central area with narrow streets between the high walls of ancient buildings. This compact, easy to walk historic core of the city extends inland from the commercial port and the most prominent of landmarks - the cathedral and royal palace. These fine monuments were built over the sacked remains of the Moorish Alcazar and mosque, raised to the ground when the Christians regained the island from the Moors. 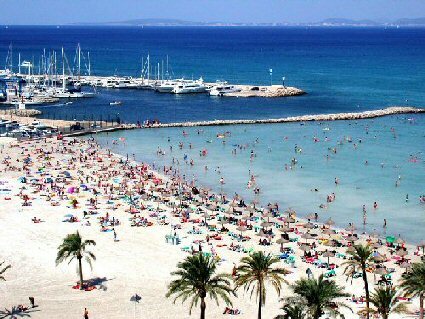 Can Pastilla and Cala Mayor are the most popular beaches among Es Molinar, Ciutat Jardi, Can Pere Antoni, EL Arenal. Any sightseeing itinerary should take in the cathedral (la Seu), Almudaina palace, la Lonja and the Arab baths, all of which are in the old centre and close to the ports. Slightly further are the hilltop castle of Bellver and the Pueblo Espa?ol. Nightlife: most vibrant, and sometimes seedy, in the El Terreno district. The old centre and tree-lined avenues around it are also lively at night.